VANCOUVER — Elias Pettersson has drawn awe from around the NHL with his stunning goals and mind-bending moves over the past two months, but those who've played alongside him say there's likely more to come. The Vancouver Canucks rookie has already notched 13 goals and eight assists in 20 games and earned comparisons to some of hockey's greatest legends. It's hype that his current and former teammates say is warranted. Andrew Calof played with Pettersson on the Vaxjo Lakers in Sweden last year and said everyone knew right away that the then-teen was a "special talent" with a insatiable work ethic. "He's a perfectionist. When he sets his mind to something he will accomplish it," Calof, an Ottawa native, said in an email from Russia where he's currently playing for the Torpedo Nizhny Novgorod of the Kontinental Hockey League. "He just would spend so much time trying to improve every aspect of his game and that's what makes him such a fantastic player," he said. "And what's scary is he will only get better and better." "He was the golden boy!" Calof said. "He was a huge part of that championship." "Whoever was on his line knew they were going to get a couple of extra points that week because Elias would do something crazy and either give you an open net or score a shot that you're think was impossible," he said. Now he's making the same sort of moves on hockey's biggest stage, deking out opponents, making jaw-dropping passes and rocketing pucks past stunned goalies. The fifth-overall pick at the NHL's 2017 draft was named the league's rookie of the month for October, despite missing two weeks due to a concussion he suffered from a hit by Florida's Mike Matheson on Oct. 13. In early November, he became the youngest Canuck to ever put up a five-point game when he helped the Canucks squeeze out a 7-6 OT win over the Colorado Avalanche. The eye-popping performance led to the NHL's second star of the week honour. While he's quickly become an offensive juggernaut for Vancouver, the 20-year-old centre is also showing his ability to be an all-around player, blocking shots and back-checking hard. "His IQ on the ice is beyond mine and beyond our team's, I think. 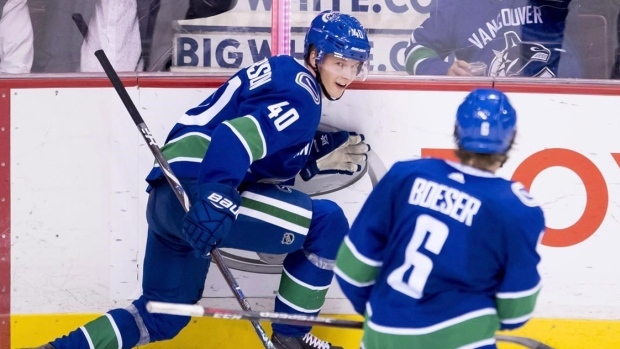 It's pretty funny," said Canucks right-winger Jake Virtanen. "When you see him out there, he's just thinking of stuff to do that no one else would really think of." Various hockey analysts have compared aspects of the six-foot-two, 176-pound Swede's game to some of hockey's best, including Sidney Crosby and Alex Ovechkin. "I see shades of (former Detroit Red Wing) Pavel Datsyuk and those type of players in him, just his hands, the way he moves out there," said Canucks centre Bo Horvat. "But I think he's himself. I don't think there's any person in the league who's like Elias Pettersson. He brings his own element to the game." "I think he's possibly one of the best players in the NHL already," he said. "He's very fun to watch and obviously a treat to have on our team." It's still early in Pettersson's career to compare him to one specific player, Calof said. "But he's definitely the best player I've ever played with," he added. "If he keeps this up, he could be the greatest hockey player to ever come out of Sweden. That's certainly something I hope for." Pettersson said being mentioned alongside Gretzky is a great honour, though it's one he isn't entirely comfortable with. "I don't know if anyone should be compared to him because he's the greatest ever," said the rookie, who is described by teammates as quiet and humble off the ice. Despite the parallels and the attention from around the league, Pettersson said he's not feeling any extra pressure and is still having fun playing the game he loves. "I'm living my dream," he said.